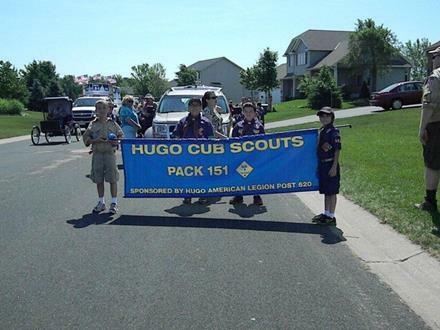 Our boys always show their unit pride at Hugo's Good Neighbor's Day Parade. We'll be walking along with the Pack 151 camp-themed trailer and passing out fun giveaways. Boys should wear their Class A / blue uniform shirts with neckerchiefs, belt with belt loops, etc. and comfortable walking shoes. Be prepared - Plan ahead for the weather. The parade goes on rain or shine. You can park near Fish's house if you are helping us participate in the parade or you can drop your Scouts off and meet us at the parade’s end to pick up your Scout. Before the parade starts at 11am, we will decorate the trailer and prep our giveaways. Scouts will be able to walk alongside the trailer and take breaks and ride the trailer when needed.